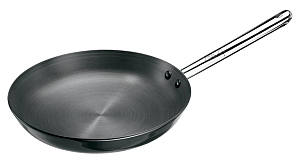 Non-stick cookware must be replaced if the surface cracks, peels or warps. Generally, you will find that this happens within 2-3 years - it does not have a long life, and proof of this is that most companies will not offer a long warranty period for it. There is no unanimous verdict on the safety of non-stick surfaces, but what everyone accepts (including Du Pont, the inventor) is that over-heating of the surface beyond 260 Celsius can cause toxic gases and chemicals to escape. They are not proven to be fatal to humans, but neither would you want to expose yourself. If like me, you bought a lot of non-stick cookware because it is cheap, attractive and practical, I do not see any need to panic and throw it all away. But it does make sense to start replacing it or phasing it out of your kitchen. 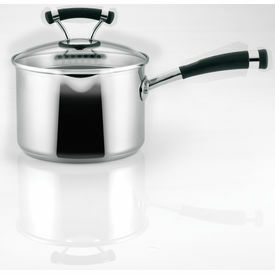 Stainless steel is perfect for boiling and for acidic preparations with tamarind, tomato, lime etc. It is the most non-reactive. However, it reacts badly in my experience to saute/ shallow fry cooking especially if you like to use less oil. It burns easily and creates dark hot spots. Therefore I do not find that it makes a good kadhai or wok. Cast iron (available abundantly in wholesale market areas and big steel shops) is great for dosa tavas, kadhais and woks. We have used this traditionally for years. We know that it leaches iron content into food, and this has been a reason to use - to enhance iron intake in the diet. Cast iron is good for saute/fry but acidic cooking including rassam, sambhar or sabji with tomato, reacts to iron giving an unpleasant metallic taste in food. I prefer cast iron for dry roasting with oil rather than any wet cooking or boiling. I have to flag off here that most iron vessels are improperly seasoned and therefore rust easily. If you have the patience and correct technique to season the vessels yourself, you are fine. Otherwise, buy from a reliable brand or supplier, even if it costs extra. I am very partial to the steel shops in Mylapore, Chennai. I have bought some awesome cast iron there. Aluminium/ hindalium is still extensively available in Indian steel shops - as tavas, saucepans, kadhai's and more. Despite the scare of aluminium poisoning triggering Alzheimer's, or causing kidney and brain problems, we continue to use them. Fact is, we ingest copious amounts of aluminium on a daily basis (soft drink cans and antacids are big culprits) and with well maintained vessels, the aluminium dosage would be minute. Mom has some age old aluminium vessels at home and Dad is quite keen that she throws then away. Aluminum does leach into food, especially with acidic preparations. And the leaching will increase as the surface becomes more pitted and old. I would say that we need to start retiring these vessels from duty and replacing them. The urgency is not as great as non-stick but it's there. Glass, ceramic and stoneware are hugely recommended as being the most non-reactive cookware materials but are unfortunately poorly suited to flame/ stoves and are most suitable for microwave or oven. Most Indian food is not cooked this way, so their utility to us may be limited. Hard Anodised Aluminium is what I have chosen to replace my non-stick. 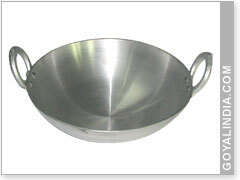 It is aluminium cookware whose surface is made non-reactive. It seems that under certain conditions, it may leach a little aluminium into food, but the quantities are extremely miniscule. If well maintained and treated with love, it will last very long indeed. 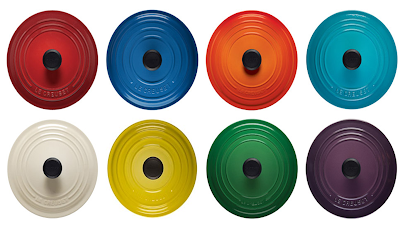 Other cookwares include ceramic coated aluminium, enamelled iron etc. However, there are some reports that some of these products from cheaper manufacturer's contain traces of lead, cadmium etc. 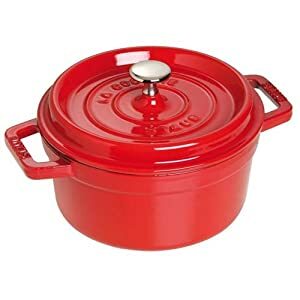 I think safety lies in buying from a reputed manufacturer like Le Creuset or Steub who have developed proven techniques and know their business well. Le Creuset costs heaven and earth (USD 200 per pot on average) but I hope to acquire one in this lifetime. This brings me to my last point. Human nature being what it is, we probably shell out more on attractive table ware, serving dishes and cutlery and less on cookware. Actually, we are better off doing the reverse. Cookware is put to a daily torture test and ought to be off good quality to withstand heat, rough washing and different types of foods/ cooking techniques. It's worth the time and effort to search out slightly more expensive cookware, which is well finished, endorsed by a trusted manufacturer and heavy rather than light. Heavy vessels will last longer, and will also hold heat for longer, enabling you to save fuel. This is specially true if you still intend to buy non-stick. A reputed brand which charges more, is also likely to put more care into creating a durable product.